Have you heard of AcceleDent? This device is the AcceleDent Aura from OrthoAccel Technologies. It is an FDA cleared medical device available around the world since 2009. The AcceleDent is available by prescription only through your orthodontist. 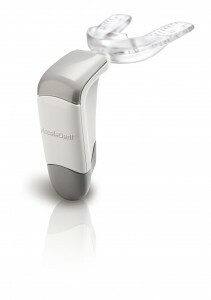 The AcceleDent consists of an Activator and a mouthpiece (similar to a mouthguard). It includes a USB interface that is used for charging the device, but which can also be plugged directly into a computer to view usage through the FastTrac patient usage report. AcceleDent can be used with both traditional braces and Invisalign. All that is required is 20 minutes of uninterrupted daily usage. The device is extremely lightweight and hands-free, which means you can go about your activities at home, or work, while using it! To find out more about AcceleDent, please feel free to speak with Dr. Forcier or one of our team members! This device may also be eligible to use Health Savings Account (HSA) funds, but it's a good idea to check with your HSA Plan Administrator.